Assault defendants, like DUI defendants, are made up of a wide variety of people. At The Herbst Firm we have had middle aged men and women with absolutely no criminal record that have been charged with this crime just as often as we see repeat offenders. The reason for this is simple: all it takes for the police to make an assault arrest is an accusation. Police will rarely conduct a full investigation before making an arrest for this crime. As unfair as it may sound, many cops prefer to close their case with an arrest and let the court system sort it out later. The effects of this can extremely harmful for the accused, even if the charges are eventually dropped. Our assault lawyers will work aggressively to fight our client's charges the minute we are hired. It is our main goal to prevent theses cases of ever ending up in court, and assuring that they can later be expunged. We also will not hesitate to fight for our clients in trial in front of a judge and jury. We offer free consultations, and are willing to travel to meet with you throughout the state of Maryland. The crime of assault actually includes battery as well, so verbal threats as well as physical contact are both included in the same law. The threat force or the actual use of force on another person that causes a reasonable fear of imminent harmful contact is the traditional definition. 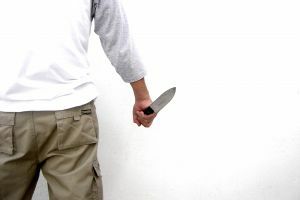 The term reasonable fear implies that the fear is subjective, and as long as the victim reasonably feared for his or her safety then prosecutors may be able to prove their case. Battery is defined as an actual and unlawful harmful touching of another person. There does not have to be a threat nor does the victim have to feel fear to prove a battery. A battery can be committed even if the victim is unaware of the contact, and suffers no actual injury from the contact. It does not include contact that is normal and reasonable in everyday life. For example, you cannot be prosecuted for battery for tapping someone on the shoulder to get his or her attention, even if the tap was intentional and unwanted. Under state law assault is broken down in various degrees, defending on the type of threat or contact, and whether the victim suffered an injury. There are only two types of felony assault in the state statute book. First degree requires a prosecutor to prove that the defendant intentionally caused or attempted to cause serious physical injury to another person. Serious physical injury is defined as creating a substantial risk of death, or actually causing permanent disfigurement, impairment of an organ, or the loss of function of any bodily member or organ. The prosecutor will generally be required to present expert medical testimony as to the extent of the injury in order to legally prove a serious physical injury. First degree assault also includes any threat with a firearm including handguns, rifles, pistols, antique firearms, and machine guns. The maximum penalty upon conviction of first degree is 25 years in prison. The Herbst Firm understand the severity of this charge and will relentlessly defend your case. Second degree assault may also be classified as a felony under state law. A defendant who has been accused of causing a physical injury to a law enforcement officer, probation officer, or parole officer may face felony assault charges with a maximum penalty of 10 years in prison. The prosecutor must prove that the officer was engaged in the lawful execution of his or her duties when the assault was alleged to have occurred. Physical injury in second degree felony assault cases is defined as any impairment of physical condition, and includes minor injuries. A police officer can simply allege that he or she suffered any injury such as a scrape or bruise in this type of case. If you or someone you know has been charged or is being investigated for felony assault anywhere in Maryland contact The Herbst Firm for a free consultation. Prince George's County Cop Found Guilty of Assault A jury recently found a former police officer guilty of multiple violent crimes after a two-day trial in the Circuit Court for Prince George's County.